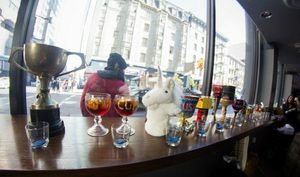 The lineup of chalices at Pimp Cup 2012. Photo ©2012 Gamma Nine Photography via Facebook. Don’t miss this chance to get crafty and try your hand at a year of free Negronis at ~JASPER’S CORNER TAP~ on Sunday August 4th from 3:30pm-5:30pm. Here’s how it works: bring a pimped-out chalice to the competition (past entries have included unicorns, Legos, and, of course, lots of glitter and rhinestones). The winner gets a free Negroni a day from Jasper’s, and everyone who attends gets bottomless Negronis on tap and serious entertainment. Tickets are $20 in advance or $25 at the door, and proceeds benefit the Bartender Relief Fund.